When it comes to prestigious events, few can compete with Crufts. The show’s impressive history dates back over two centuries when the crowd-pleasing spectacle was merely an idea in the mind of its founder, Charles Cruft. Cruft’s humble beginnings saw him progress from a regular employee of Spratt’s ‘dog cake’ manufacturers in Holborn, London, to a household name recognised the world over. Whilst working at Spratt’s, Cruft travelled to Europe and was invited to organise a dog show for the 1878 Paris Exhibition at the Exposition Universelle. Cruft’s fresh ideas and entrepreneurial spirit gained him a favourable reputation that followed him home on his subsequent return to England. In 1886, Cruft was put in charge of ‘The First Great Terrier Show,’ which took place at the Royal Aquarium in Westminster. Five years later, the first Cruft’s Show was held at the Royal Agricultural Hall, Islington, attracting a modest audience by today’s standards. A total of 2,437 dogs were entered, comprising 36 different breeds. 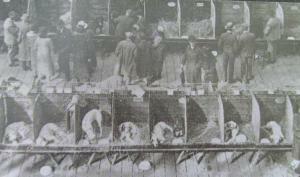 From then on, the success of Cruft’s increased year on year, with 10,000 entries being registered in 1936. The ‘Best in Show’ award was first introduced in 1928, with Primley Sceptre, a Greyhound owned by Mr Herbert Whitley – founder of Paignton Zoo – claiming the prize. The ‘Best in Show’ was awarded to its first female owner, Lorna Countess Howe, in 1932, whose charge was a Labrador Retriever named Bramshaw Bob. In the summer of 1938, Cruft fell ill and died of a heart-attack in early September. He was buried in Highgate Cemetery, London. His second wife, Emma, initially took over the running of the show but soon found it too heavy a burden. In 1939, the show was sold to the Kennel Club but, due to the outbreak of the Second World War, it wasn’t until 1948 that Cruft’s was re-opened to the public. The show was first televised by the BBC in 1950 and, in 1961, entries surpassed the 15,000 mark. By this time, Crufts had become an ‘obedience championship show,’ which meant that working sheepdogs and their crosses were allowed to compete. This was the first time crossbreeds had been entered, which marked a milestone moment for the show. During a rebrand in 1974, Cruft’s with an apostrophe became Crufts without one, as the Kennel Club decided it was no longer necessary. 1974 was also the year that Crufts became embroiled in a murder trial. A man who had begun an affair with a woman he’d met at Crufts was murdered by his wife (with the same implement he’d used for cutting up his dog’s food). Fortunately, Crufts’ involvement was purely circumstantial and the show went ahead unhindered. Agility was first introduced to Crufts in 1978, which brought huge public excitement. To accommodate the ever-expanding crowds, Earls Court was chosen as the new venue the following year. In 1982 and again in ’87, the show was extended from 2 days to 4 as spectators flocked to the show stands. By 1988, the number of people attending Crufts had exceeded 110,000. When Crufts was due to hold its centenary show, the venue was moved once again, with Birmingham’s NEC being the new location of choice. The NEC could accommodate even larger audiences and was easily accessible via UK motorways and airports. In 2008, Crufts was at the centre of a media storm when a BBC One documentary, ‘Pedigree Dogs Exposed,’ raised a number of health and welfare issues regarding the breeding standards and practices of pedigree dogs. Responding to claims that Crufts permitted standards that compromised the health of dogs, various high-profile sponsors withdrew their participation in the show, as well as other events hosted by the Kennel Club. In 2012, compulsory vet-checking was introduced for the very first time, which meant no dog could receive an award before it had been given the all-clear. Particular notice was paid to breeds such as the Basset Hound, the Dachshund, the Pug, the Bulldog and the German Shepherd. This year marks the show’s 124th year (Crufts was stopped for the duration of both World Wars and on account of an electricians strike in 1954) and it is expected that in excess of 21,500 dogs will be attending - a huge leap from the 2,437 competitors of 1891. Crufts has come a long way over the years and who knows what the future holds for the show. Its increase in popularity and size is surely testament to its history, with many sharing in the passions of Charles Cruft himself. Since i was a little girl i always wanted to go to the Crufts dog show. Sixty years on for one reason or another i still haven't been so would love to win this prize and make it the year i finally go! I would love to go and see a crusts show have never experienced such a wonderful thing to do . We have a wonderful time!! I have watched Crufts many times on television but would love to experience the real thing! I have a great interest in Crufts always follow on the TV. Makes you appreciate how amazing all dog breeds are. Such very beautiful animals. I visited Crufts for the first time last year, we had wanted to visit it for years , however, it never seemed to happen, we enjoyed it so much, that we are visiting again this year & all the coming years. Im a big dog lover so what a lovely way to spend a day at he best dog show in the world. I love crufts seeing the agility and the heel work to music. Also love seeing all the different dogs. I always end up buying so much for my dogs as you get to see all the different things available. Always well worth going. I have had and loved dogs all my life and to go to Crufts would ,Now I am 70 and disabled, be the icing on the cake. It would be an un forgettable experience. I would like to see all the hounds and all the breeds we never see in normal life. Primley Sceptre, a Greyhound owned by Mr Herbert Whitley, was the 1928 winner of the Best in Show award. The history of the show is fascinating. I have watched it on TV many times. It would be very exciting to actually visit to see all the amazing dogs and their enthusiastic owners. When our fabulous Fox Terrier, Roger, died at the age of 16 we were heartbroken. But the time is right to welcome another canine companion into our lives - and where better to start the search than at Crufts.